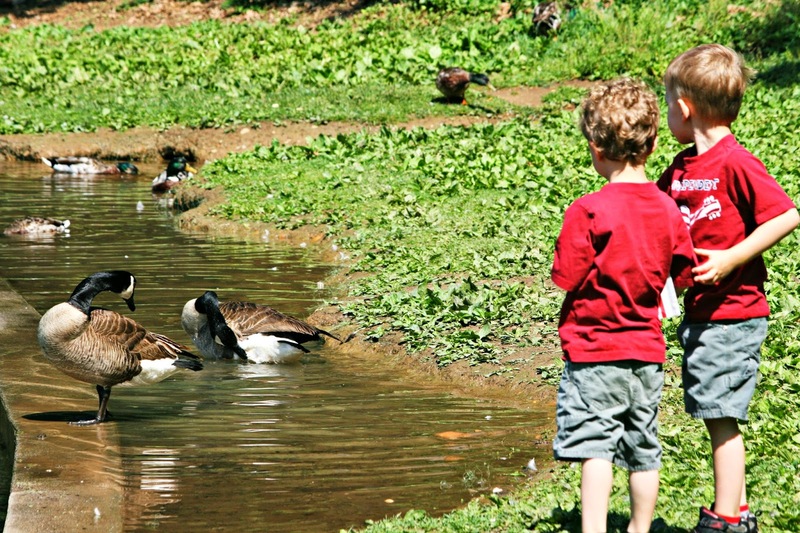 Last year we had a trip to the duck pond on our summer bucket list, but never had the time to go. So this year, we made that a priority for our first week of summer vacation. We brought some popcorn and bread for the ducks. And geese. There were so many to see, and it was a beautiful day. Lots of babies to around. The hole of doom. Which ate a shoe from each of the twins. See the shoe in there? Many tears over the hole of doom! He seems to be doing alright though. Nice photos, glad Pierce is getting to play even if a little subdued. 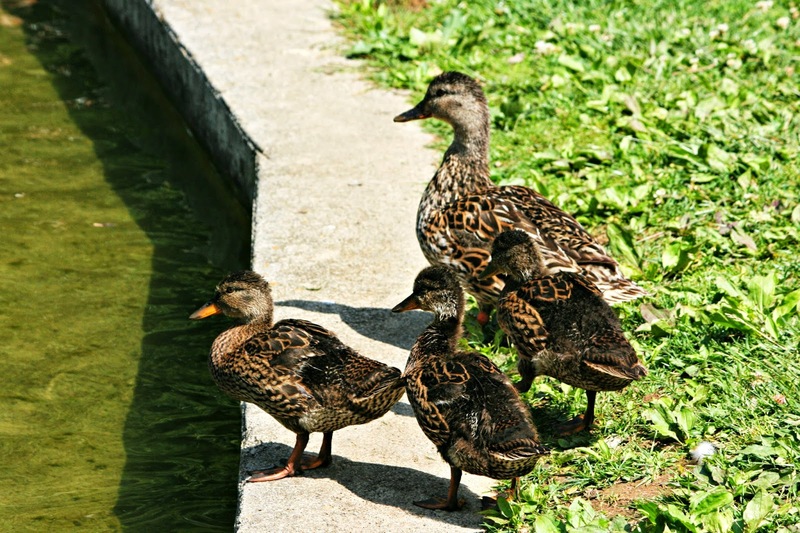 I have fond memories of the Duck Pond in Salem. My parents took me there as a toddler and there's the annual fishing rodeo. Great memories! We only have The Rez, but I only see ducks and geese there in the spring. Bad hole of doom! Duck pond at Virginia Tech is so lovely. It's the #1 spot on campus for couples to get engaged. Quite a few ducks on the 6 ponds down the road.There is a duck crossing sign on the four lane. 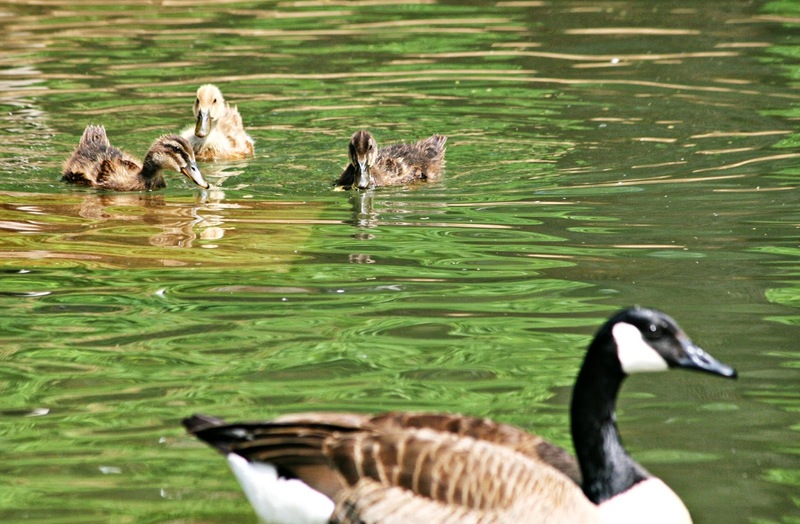 If there's water, there are ducks and Canada geese... it's far less likely without something fowl in the water. This brought back memories... I ended up being chased by a big flock of canadian geese while screaming and running away. Needless to say, I don't feed the birds to often. Looks like the boys had fun! sweet growing youngsters - yours and the ducklings. Such a lovely day for your sons. 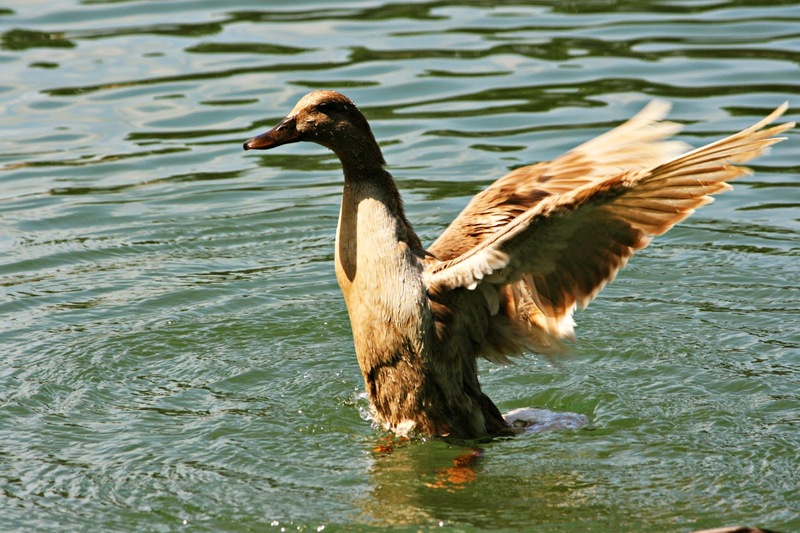 It's not easy to find wild duck that live wildly here, except on the zoo or park. But usually we don't permitted to feed the ducks. If you ignore all the signs that say "don't feed the geese", which everyone does, we can feed the ducks and geese at the little lake near our house. I cheered when I saw your title! Well, first I will tell you something not many people know. The news is always telling us not to feed the ducks bread. Most people do that, but it gradually kills them. Quite a few have died from it in our pond. Our park put up special boxes with duck food that you can put change in and get a bag. But I have not known what to feed them in it's place when we have no change. Apparently dry dog food is the thing. Now I'm wondering about maybe using our cat food, I will Google it and see. The picture of the bird with his wings up is cool. So is the last one of the boys. I'm sorry you have a hole of doom with a shoe being held hostage in it. Silly hole. There are a pair of ponds near home that do have transient wild ducks, but we would rather catch fish than feed the ducks. The main lake in town, has a dozen or so tame ducks. You mean they both lost a shoe in that hole??? That is funny - they look like they had a great time. 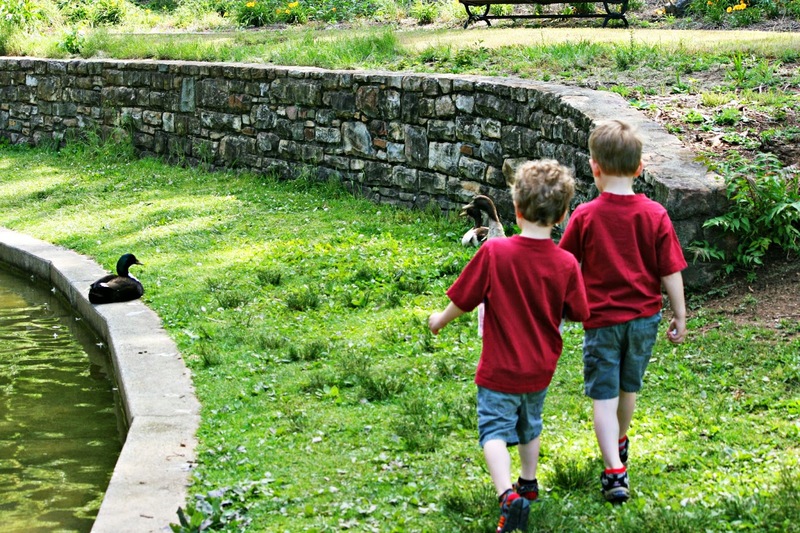 We do have a beautiful place to feed ducks - it's a gorgeous cemetery that you can't even tell it's a cemetery - but it is beautiful - with ducks and waterfalls and more. No ducks around here. Some geese, but our pond dried up a few years ago. No. Nobody allows it anymore. All the parks don't allow feeding them because it just makes a mess and makes the ducks dependent on humans. I feed the birds at home though--does that count? That darn hole of doom! Hope Pierce feels better soon. 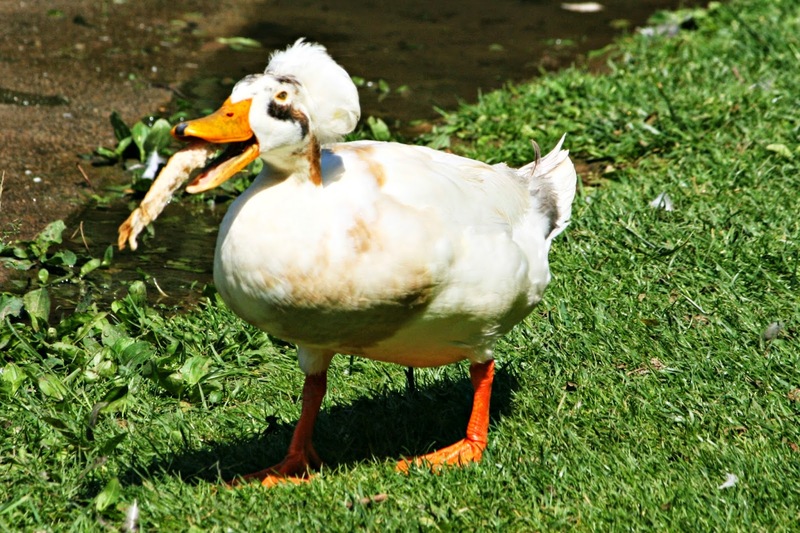 Yes, we have plenty of places to feed ducks, but some of them can be a little obnoxious. We have a small walking trail in town that runs down by the creek. There is always ducks there!!! Yes, but I don't feed them. Other people feed them and I don't want to make them fat. sweet pics, especially the last one. the only duck pond i know of is the one is salem but we've never been to it. where i grew up we had a pond we'd go to called lindo lake. great memories of feeding the ducks there! There are many lakes, rivers, ponds in this area and canadian geese and mallards are abundant. There is an orchard market not too far from here that has a large duck pond and they sell bags of cracked corn to feed them. When my kids were small we went often. Nice pictures, and oh, that dratted hole! Not now where we live. The other place had "families" of ducks all over the neighborhood. Love the reflections from the water and the variety of critters! 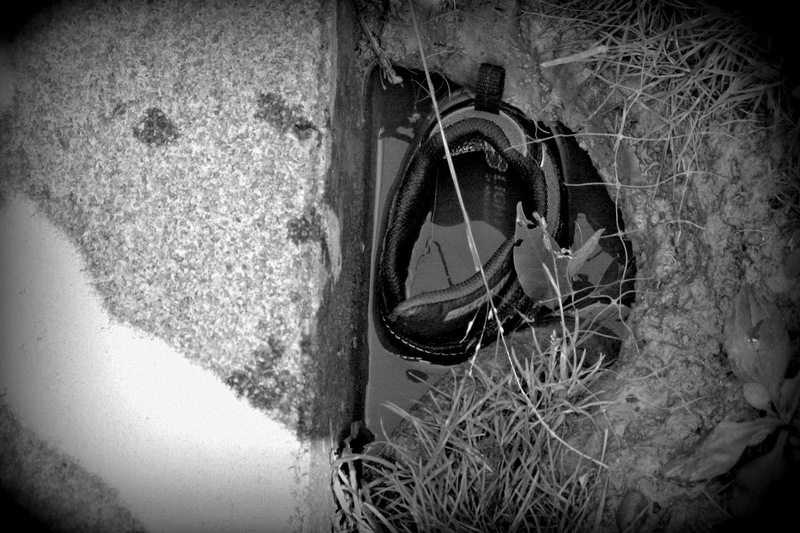 Were you able to get the shoes out of the hole? I hope Pierce is doing well with his arm. We have ducks and geese down on the river. I need to go for a visit! 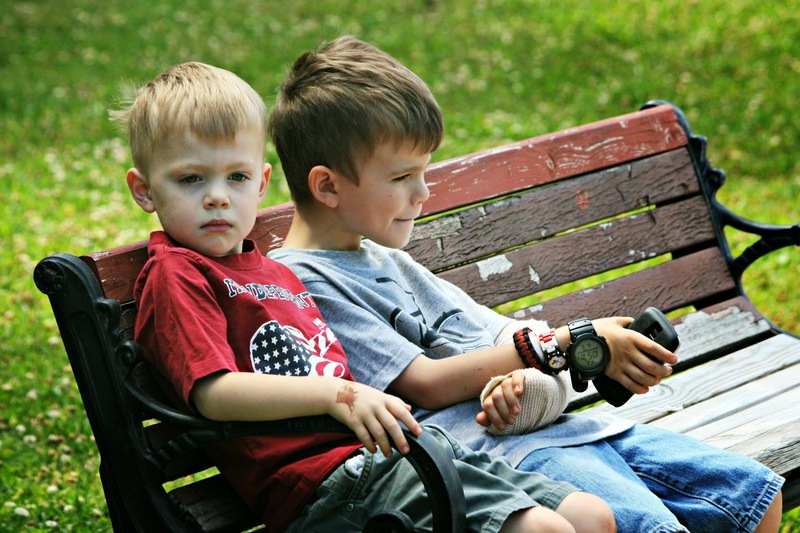 Glad to see your little one is moving around well despite his arm injury. 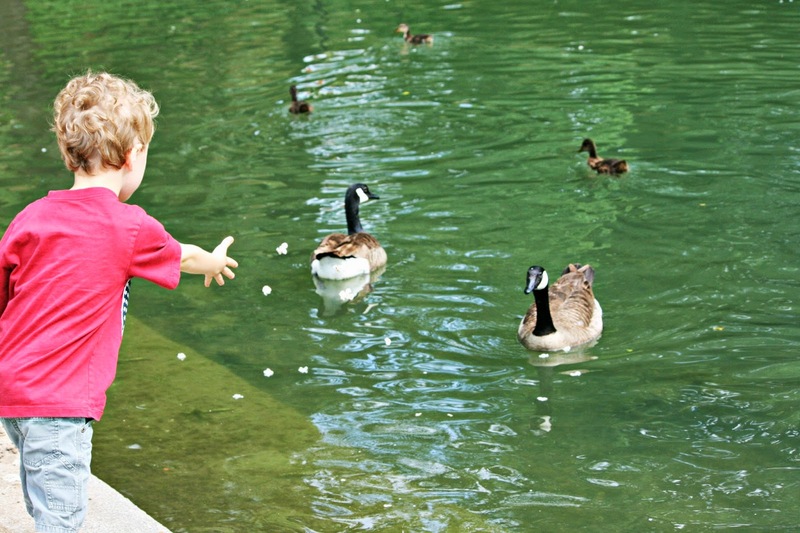 We have 2 nice parks that include feeding the ducks. In the winter when we go to these places, the ducks are so hungry, they almost walk up to your car begging. In the summer, if you try to feed them late on a weekend, they will just glare at you--fat and happy from lots of previous family feedings. No. We have the canal in downtown Scottsdale, where nodals are floated. But in Addison, Texas I did my daily walking around a man made lake where Mallards flew in and out like an airport! It was fun to bring along break and toss it into the water and watch them race to snap it up! Looks like your trip was just ducky (except for the shoe-eating hole)! They are handsome boys! What a fine family.